For Windows users who love to play around and mess with the registry, RegSeeker is a freeware utility that will surely be your best companion. 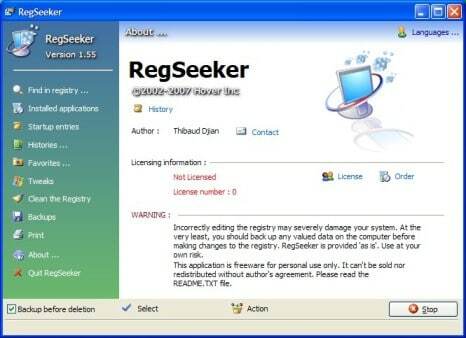 RegSeeker is a powerful registry cleaner. It’s also a powerful registry management tool that can display various information such as startup entries, several histories items (URLs, recent documents, and even index.dat files), installed applications with their uninstall information, color schemes, Internet Explorer favorites and many others. Users can use RegSeeker to search for any item inside system registry, and the export, backup and delete the results, or simply open the the search results in the registry editor. The registry cleaning feature will find invalid and unused registry entries for deletion and cleanup. New feature added a file tool to search for duplicate files or bad shortcuts. For power users, RegSeeker also includes a tweaks panel to optimize your the operating system via registry. Best of all, RegSeeker is freeware, free to download and free for personal use. It supports Windows XP/Vista/7/8/8.1/10 x86/x64 platforms.